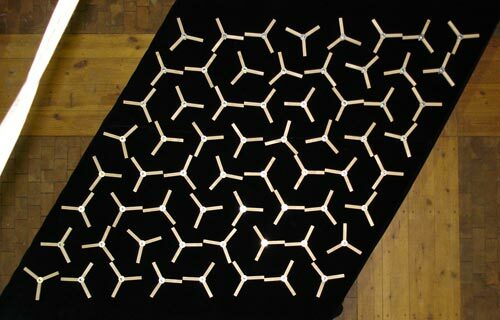 A large-scale hexagonal grid of rotating units demonstrates a number of phenomena, such as pattern formation, magnetic forces and the trajectories within a dynamical system. Magnetic forces in each of the rotating arms cause a chain reaction of movement affecting neighbour units and moving across the grid. Our physical model gives participants the means of a direct and intuitive interaction with a simple dynamic system, combined with an interesting aesthetic experience. Participants are invited to interact with the sculpture by turning the units, which produces movements along unpredictable lines. A projection on the wall shows the spreading of the movement in realtime, through the application of a motion detection filter a video feed that is taken of the installation from above.